Lakshmi is the goddess of abundance, loving kindness, beauty and wealth. She reminds us that we are rich by nature. She represents the compassionate feminine heart that flows naturally, like the love of mother earth that is constantly giving and offering her gifts. In the journey to meet Lakshmi, we enter a luxurious garden full of shinning trees and beautiful colorful smelling flowers and orchards full of the most delicious tasty fruits and organic vegetables. She is the goddess of abundant nature and sustainability. We meet her in our clean homes, in beautiful smells, in all kinds of inner and outer beauty, in freedom and harmony. She loves nice comfortable clothes, flowers and the luxury of relaxation. When we call her, Lakshmi comes to us with a gentle smile, as a beautiful woman with a golden face, wearing colorful clothes, and she emerges sitting on a lotus flower. 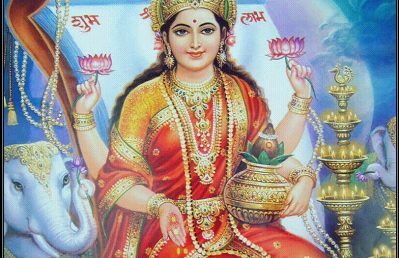 She has four hands: in two she holds pink lotus flowers, in the third a pot of valuables, and from the fourth hand gold coins flow constantly down her feet and into the earth. Her generous, gifted hands are directly connected to her heart, and as she receives our offerings with a smile she immediately opens her hands to offer them back into the world. She is the essence of generosity, fertility, and an emanation of female relaxation and well-being. How do we discover Lakshmi in ourselves? How to connect with her? How to experience her? She is one of the archetypes of the feminine energy, so each woman carries her as a potential. She is part of our nature. We just need to create the right space and environment, which is easy when women join their natural gifts, their hearts, intentions and, together, call her divine energy… through dance, through breathing freely and through sharing. While our arms and hands swim in the dance we feel our heartbeat, we breath deeper, we swing our hips, we smile. There she is! The goddess Lakshmi brings the questions to us contemporary women: How much space do I give myself to experience beauty, abundance, harmony, and balance in my life? What beauty do I see in myself, in others and around me, in the world? Do I give generously? Do I accept with joy? Am I aware of my internal wealth? How I use this inner abundance? She reminds us: you can make a practice of being attentive to all manifestations of beauty and abundance in your life, and you can consciously collect these precious moments when you notice them… It will strengthen your heart! A Dream of Creation and Re-creation of Life Durga – The Warrior Motherly Goddess.